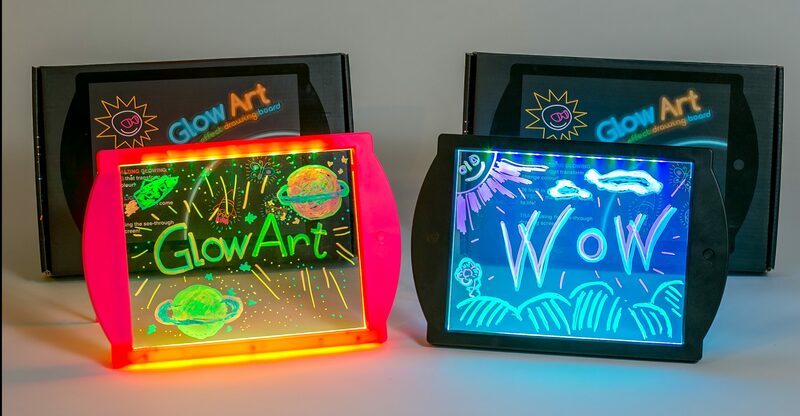 With Glow Art kids can take their imagination to a whole new level. The four fluorescent markers included can be used to create fantastic works of art. 36 selectable modes use multi-coloured LEDs to flash and light up the board in different ways, transforming and bringing their art to life! The see-through screen means kids can trace their favourite pictures and even very young artists can learn basic drawing skills this way. Play games on the Glowart board for more fun! It's also a great educational tool – letters, numbers and shapes can be given to trace. Also, allowing kids to do their maths homework on GlowArt will always make it a lot of fun! From 3 years to 16 years – the Glow Art grows with your skills. Glow Art is part of CDK Developments, the parent company highly acclaimed for the Sing My Name gifts. Gifts that bring real smiles and laughter.